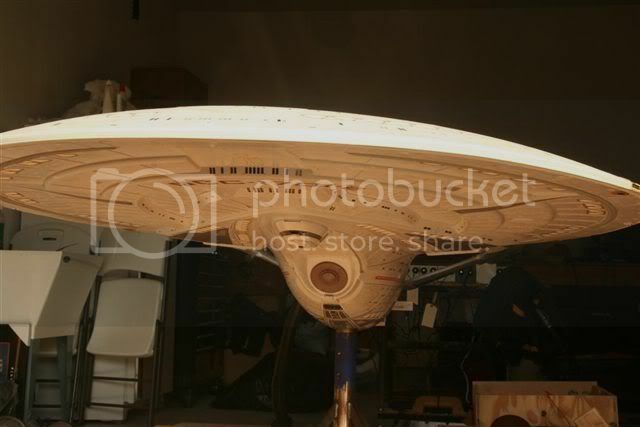 While this is the 76th week of auctions, It is titled Week 84 to be consistent with the Star Trek Auctions Archive. First I should mention that I accidentally deleted Week 83. I wrote it Thursday, so if you didn't read it yesterday, well, sorry! No going back now and I am DEFINITELY not redoing it! There were 75 auctions this week. A nice, simple amount that is easy to handle. Only 3 items sold for over $ 1,000. and there were NO costumes! I think the top prop, though there were some good ones, was the Enterprise Daniel's Temporal Device a which went for a strong $ 1,809. 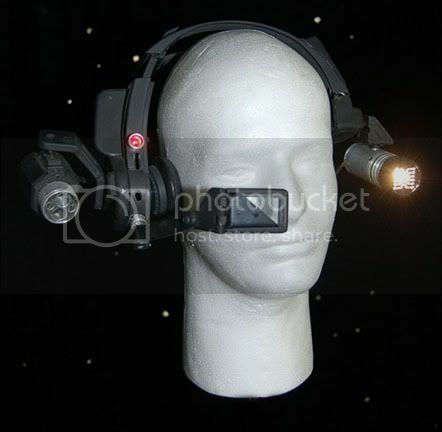 I have one of these props, but it was used in "Regeneration" and doesn't have the case. I love the prop though. Even though it is rubber, they are amazingly detailed and well painted. 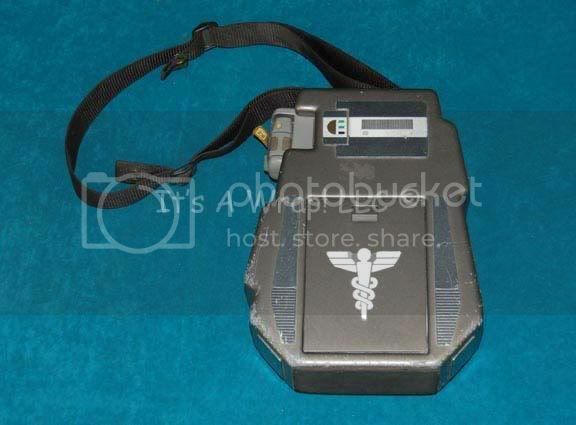 Now I did like the TNG Starfleet Medical Away Team Case which sold for a quite reasonable $ 1,176 because it actually had the Medical Tricorder that goes in the slot on the side. 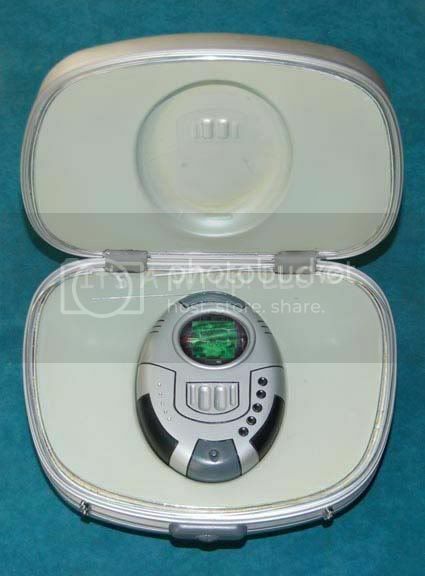 The previous ones IAW has sold didn't have the Tricorder. Now, it might be a dummy, but still, it makes this one the best version yet. 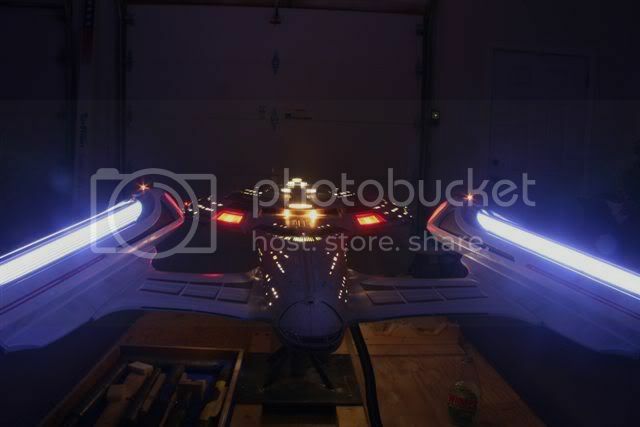 Star Trek: Enterprise Shran's Ushaan at $ 1,025 was a good deal as this one was metal. The fact it has "blood" on it is really cool. The TNG Starfleet Type IIIb Phaser rifle at $ 901 was a rubber version, but this was a great price for a really nice one. I love this version and think it is the best looking of the Phaser Rifles. 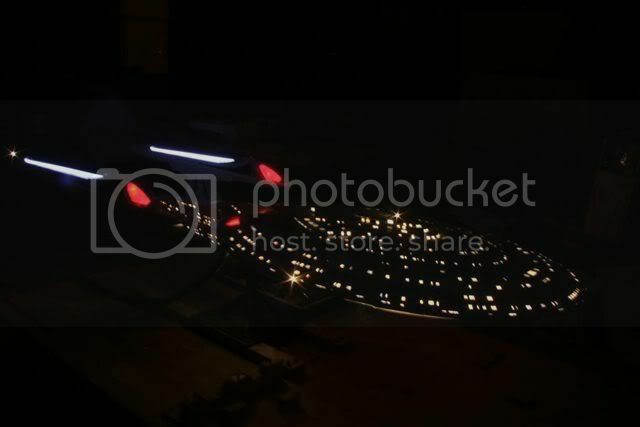 The Enterprise Bridge Data Module at $ 838 went to Forum member Chrissie from Australia and its cool because of all the individual modules. The Seven of Nine Borg Implant went for a healthy $ 827. I am not surprised it went this high as Seven is so popular. The Andorian Carbine and Holster went for $ 720, which is reasonable, though the Holster doesn't go with the Carbine. It goes with the pistol version. The Non-Cabal Suliban Energy Pistol was an absolute STEAL at $ 375 and gets my Best Buy of the Week. I wish I had bid on this baby. Best Costume of the Week: There were None! Sleeper of the Week: Noss Field Glasses from "Gravity" were a great deal at only $ 265. Star Trek: TNG Starfleet Medical Away Team Case at $ 1,176. 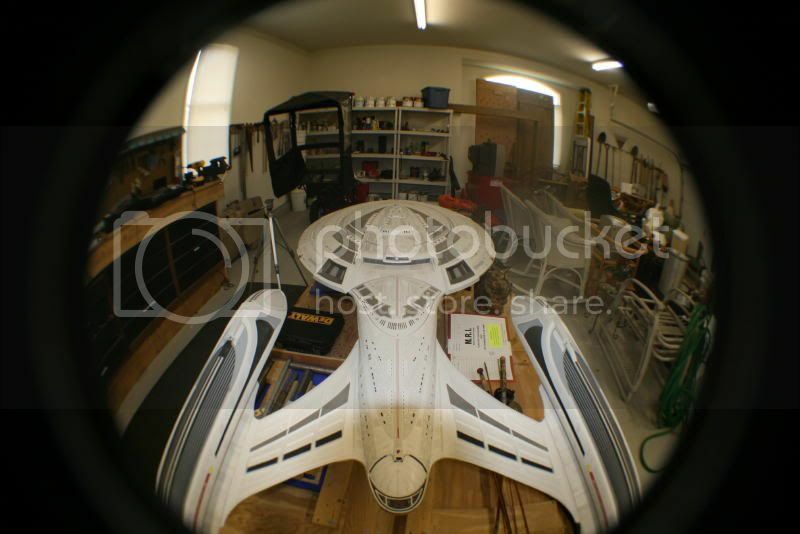 While this is the 74th week of auctions, It is titled Week 81 to be consistent with the Star Trek Auctions Archive. There were no auctions for Week 80 and there will be none for week 82 according to Burt's system. Just got back from Vancouver and San Diego. Lovely cities both. The weather was beautiful and I got to have some fun. This was a huge week with 182 items listed. Colin talked about takings ome time off to write descriptions for the items going to Vegas, but this certainly wasn't the week! The Commander Riker Two Piece Uniform went for a VERY healthy $ 5,250. This is Captain's territory and I would have thought this would go in the $ 4,000 range. Still, he is a popular character and this will hold it's value I think. The Ben Sisko Variant Captain's Uniform went for $ 3,501 and was pretty reasonable at that price. It had the very rare vest despite not having a jacket, so was like we saw in "In the Pale Moonlight". The Captain Tucker Starfleet Uniform at $ 1,825 was a great deal. Tripp is VERY popular and this was a steal for sure. This had rank pips too and so that makes it even more interesting. The Guinan Costume at $ 1,725 was a great deal too. Guinan costumes haven't been as common as you might think, and she is certainly a popular and memorable character, so I think this was a good buy. 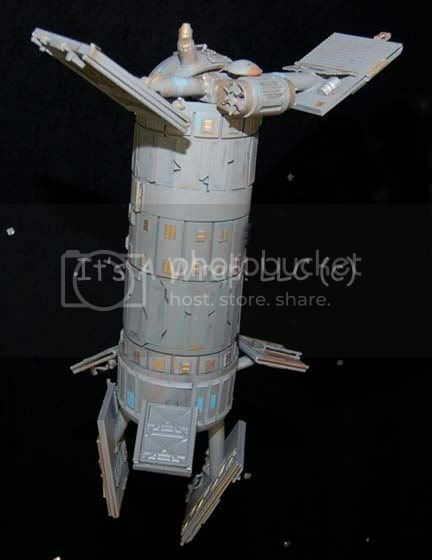 At $ 1,276, forum member John Nichols got a very nice deal on the Voyager Seska Uniform. This is pretty rare, since Seska wasn't in a Starfleet uniform for long. But I think it is an important costume in Voyager lore. The Enterprise Admiral Forrest Arctic Gear Costume at $ 1,225 was an interesting costume, but a bit more than I would like to pay for a costume that wasn't very important. The Harry Kim Uniform lot at $ 1,152 was a steal! Good deals like this are to be had these days and you just need to look for them. The T'Pol Pilot Away Team Jacket at $ 1,125 was a very good deal. T'Pol items are expensive and this is as close to a uniform as one might get. Sorry I missed this one! My Aussie friend Chrissy won the Operations Gold Starfleet Uniform for $ 1,025. These are really nice and display well. The material actually looks good in person, even though the actor's hated them! The First Contact Style Data Stunt Uniform went for $ 1,009, which I think is a very good deal. It is nice to be able to get a costume that is identified with a character and at the same price you would pay for a background costume. Romulan Senator Robes finally came back down to Earth (sort to speak), and sold for $ 889. 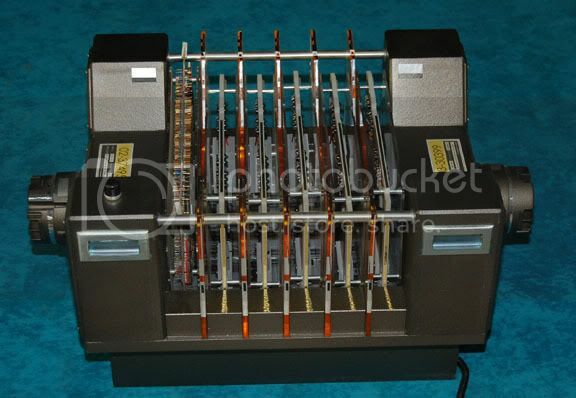 At $ 2,524 the Enterprise E Master System's Display was overpriced as it wasn't actually used on a LCARS. Looks like an extra that was never used. My buddy Alex from Hong Kong won the Generations Enterprise B Media Kit at $ 1,604, which I think was a bit high. The last won of these went to Grant from Canada and when delivered was totally broken. This appears to be the same one, and I hope it isn't. Meanwhile, on the other side of the world, my buddy Willie won the Starfleet Type III Phaser Rifle at $ 1,325, which is actually the EVA rifle used in First Contact. Molded rubber, but pretty sharp, this was a bit higher than previous ones, but fairly priced none the less. The Starfleet Yard LCARS Panel Lot at $ 910 was a pretty good deal. So many of these go for crazy prices. But I think this was a smart buy. Best Costume of the Week: The Commander Riker Two Piece Uniform at $ 5,250. Best Prop of the Week: The Starfleet Type III Phaser Rifle at $ 1,325 was VERY cool. Best Buy of the week: The Harry Kim Uniform lot at $ 1,152 was a steal! Worst Buy of the week: At $ 2,524 the Enterprise E Master System's Display was way overpriced for something never used. 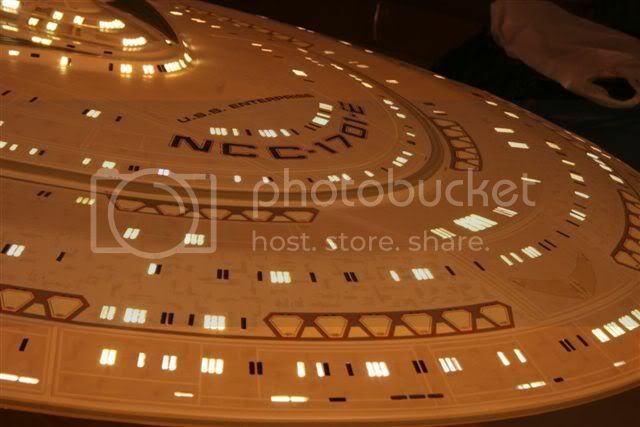 The Enterprise "E" model that was sold at Christie's for $ 100,000, is up for sale by Frank DeMartino, the winner. Frank won the model after the high bidder was found to be over his credit limit with Christie's, much to Frank's relief! Frank had been outbid on Picard's Captain's chair and was already figuring out what else to try and win when Christie's called him and said the item was his. Semi-retired, Frank feels the model deserves a better home, and although he already has a good offer on the model, he is hoping the Sci Fi museum may be interested, as he would like the model available for all fans to enjoy. A Review of "An Illustrated Guide to the Care of Costume and Textile Collections"
by Jane Robinson and Tuule Pardoe, (c) 2000, Museum & Galleries Commision, London. I recently purchased my first screen-used costume from It's a Wrap—a wonderful two-piece "command-red" Star Trek: The Next Generation Starfleet uniform. I was thrilled to get it, but as I took it out of the box for the first time, the awesome responsibility I'd accepted hit me: the proper care and preservation of this historic Star Trek item is now up to me! My background is in computer science and instructional design, not museum studies or textile conservation. Costume care seems to be one of the more complex art conservation tasks, too. Prior to this purchase, my collection consisted entirely of "wall art"—pre-production sketches and paintings, and production signage. It's relatively clear how to take care of such items: take them to a reputable frame shop and have them framed in archival, unbuffered acid-free mats, unbuffered acid-free backing board, and ultra-violet (UV) filtering plexiglass. The UV-filtering protects the art against fading, and the plexiglass protects the art against damage from shattering (an issue for those of us living in California earthquake territory). Unfortunately, there are no comparable shops where you can take a Hollywood costume to have it prepared for safe, archival display. This is the age of the Internet, though, so no one is without resources. After a bit of searching, I found a useful document aimed at professional museum curators: An Illustrated Guide to the Care of Costume and Textile Collections ("MGC Guide"), published by the Museums & Galleries Commission (MGC), a national advisory board for museums in the United Kingdom. The MGC Guide is divided into five chapters: Basics, Collection Maintenance, Storage, Display, and Specialist Help. Collectors buy costumes for all kinds of reasons, including the desire to try them on or wear them to conventions. However, the MGC Guide warns that skin oils and salts can transfer to the surfaces of your costume. Over time, such areas will "become visible as yellowish, greasy discoloration[s]." [p. 7] The MGC Guide therefore explicitly states that "costumes in museum collections should never be tried on." [p. 7]. It additionally recommends that you should move the costume as seldom as possible. When you must move a costume, you should provide as much support as you can. Two simple support methods suggested by the guide are to either lay the costume horizontally on acid-free boards, or to support the top with a padded hanger held in one hand with the bottom draped over your other forearm. 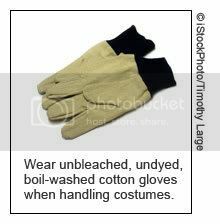 You should wear unbleached, undyed, boil-washed cotton gloves whenever handling costumes or textiles. Use barriers where necessary. There are many possible approaches to displaying costumes. Some collectors like to put the focus on the costume itself as an independent artifact; others like to put the costume on a life-like mannequin as one element in a larger, life-sized diorama, with starship wall panels, turbolift doors, or other scenery (whether original screen used or replica) in the background. This latter approach presents problems because materials commonly used to build such scenery (e.g., wood or medium density fiberboard (MDF)) can give off fumes and gasses which can damage textiles. When such materials are placed inside an enclosed space with a costume (as in a glass booth or showcase, for example), the negative affects of outgassing are accelerated. Furthermore, paints and varnishes do not provide sufficient protection. So the MGC Guide recommends coating the surfaces of such materials with "a metalised plastic film" [p. 8]. Specific brands mentioned include Marvelseal, Moistop, and Seet. I couldn't find any online information about Seet. The other two products don't seem to be transparent, so I'm a bit confused about how to use them to seal up vapors from wood or MDF scenery. It appears that you can paint over the Moistop sealant, but then wouldn't the paint vapors be an issue? Alas, the MGC Guide is unclear on this point. Incoming textiles and costumes should be quarantined before being displayed or stored with the rest of the collection. This is to allow for monitoring for pest infestation. If the incoming item is infested, it should be sealed in a clear polythene bag. The MGC Guide is, unfortunately, not specific about how long the item must remain sealed. It refers readers instead to a different document, Integrated Pest Management by Pinniger and Winsor, published by the MGC in 1998, but I haven't read it. However, while searching for information about Marvelseal (see above), I found a web page about anoxics on the Sorbent Stystems site. It says "Anoxic storage is a method of storing artifacts in a low-oxygen environment. It slows deterioration...and is now the favored means of non-toxic insect eradication (research indicates that most insect infestations will be eliminated in an anoxic environment in from 5 days to 2 weeks at less than 0.5% oxygen)." It goes on to say: "Create an airtight microenvironment with a flexible oxygen barrier film and remove the oxygen using an oxygen absorber." Sorbent Systems claims to sell everything you need, including the bags and oxygen absorbers, but I have not personally tried them yet. Only surface cleaning is part of regular collection care activities. Dry or wet cleaning is best left to conservators. 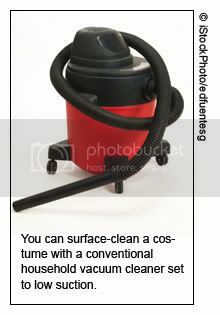 To surface-clean garments, you can use a household vacuum cleaner. Set the machine to low suction, and cover the nozzle with netting—this is to prevent any small items (like buttons or beads) that might come loose from being lost in the vacuum cleaner bag. If necessary, you can use a soft brush with natural bristles to help break particles free from the garment and into the stream of suction. The boxes should have length and width that match that of the unfolded garment (best practice) or have width of the unfolded garment and length that requires only one or two folds across the garment (basic practice). 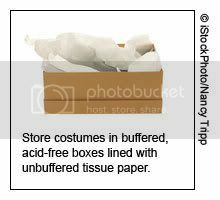 The boxes should be constructed of buffered acid-free box board lined with unbuffered tissue (best practice) or if you use regular cardboard boxes instead, they should be lined with buffered acid-free tissue (basic practice); the tissue must be checked annually, and a regular program of replacement for the boxes must be implemented. Lids should be sufficient to keep dust out but not so tight as to create suction when lifted or to require shaking the box to loosen. Place garments in boxes so that the most identifiable features of the garment end up visible on top. Cushion the folds in the garment with crumpled tissues to prevent creasing. Can the shoulder area support its own weight? If the costume has only narrow shoulder straps, or flimsy material at the shoulders, it should be stored in a box, not hung. Is the fabric susceptible to distortion? Costumes made of knitted or bias-cut fabrics should be stored in a box, not hung. Is the weight of the costume evenly distributed? Costumes that are bottom heavy should be stored in a box, not hung. Does the costume have tears or other damage in the fabric? 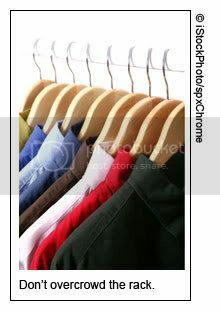 If the garment has many areas of weakness or widespread damage, store it in a box, not on a hanger. Does the costume have loose trimmings? Costumes with loosely attached parts, such as loose lace, beads or fringe should be boxed, not hung. Don't overcrowd the rack. A common myth is that hanging costumes takes less space than boxing them. This is not true unless you overcrowd the hanging costumes, which causes more damage than overcrowding in boxes. The guide suggests allowing a maximum of 10-12 items per meter of rail "for pre-20th century garments or any tailored garments," or "up to 20 items of children's wear [or small aliens like Ferengi?] or ladies 20th-century dresses." The guide is silent about rail ratios for 22nd-, 23rd, 24th-century and later garments, so Star Trek collectors will have to extrapolate. Store costumes in furniture made of metal, not wood, with rails at least 1.8 meters above the floor. 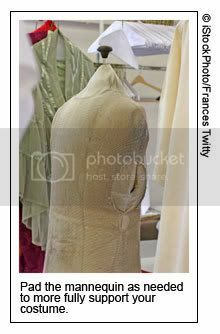 Prior to hanging, place costumes in loose, side-opening garment bags made of boil-washed cotton that is unbleached and undyed. Cover wooden hangers in aluminum foil, then wrap them in boil-washed undyed and unbleached cotton stuffed with polyester wadding to provide cushioned support to your costume and protect it from acid and other pollutants in the wood. Exclude ultra-violet (UV) light from all light sources. Keep visible light levels and duration of exposure to a minimum. Display costumes in sealed, metal framed showcases that have been specially designed for museum use (best practice) or build your own from conservation-quality materials and include controlled ventilation. The final chapter covers Specialist Help. It gives a brief overview of some services that textile and art conservators can offer, and provides some contact information for a limited number of United Kingdom-based conservation resources. Overall, the MGC Guide is worth reading. It's not very long, though it can be a bit dense. It won't answer every question, but it does provide a good starting point. I'd like to end with some pointers to other resources and a plea that we continue the discussion about how to conserve and care for the items in our collections over on the discussion forum. If you're going to be attending the Comic-Con International in San Diego this year and can stay in San Diego an additional week, the Balboa Art Conservation Center is putting on a three-day Focus on Collections Care workshop in San Diego's Balboa Park from July 30 through August 1. I'm signed up for "Preserving Museum Collections 101", "Care of Collections: Books", and "Care of Collections: Textiles". Maybe you'd like to join me? One source of conservation-quality mannequins I've been able to find is Dorfman Museum Figures. Their Conservation Forms are made from conservation-safe materials, and they also sell padding shirts for bulking out mannequin forms, and padded, conservation-quality hangers, should you choose to store your costumes by hanging instead of in boxes. Each week, the members of the Star Trek Prop, Costume & Auction Forum nominate and vote on what is the coolest item of that week. The winner gets the world famous "Cool Item of the Week" award! Finally caught up! This was a close race, decided by one vote! 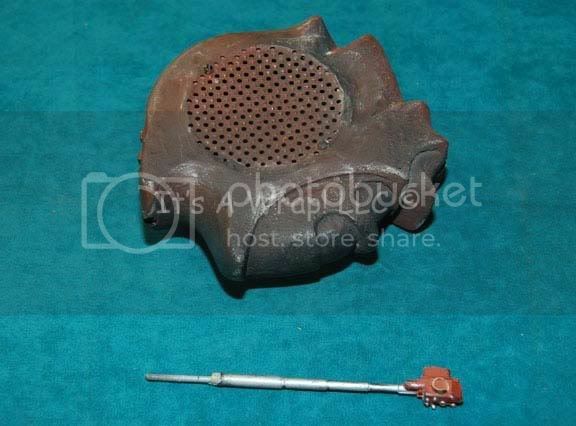 The Klingon Translation Device won out over the Cardassian Legget Damar costume. Well, this race was so close we had to have a run off between the top three! But in the end, my good friend Donna, (whose Maroon Captain's Uniform won the award last week for her) found herself with another Cool Item of the Week win! The T'Pau Minister Robes was clearly the Coolest item in my book, and I am surprised that there was a run off. While the female Klingon Uniform was cool, we have seen those before. And the Gowron Baldric was also cool, but I think the most important, as well as the Coolest Item won. I am continuing to catch up and should be up to date by beginning of the week! 50 Forum members voted and the Maroon Female Captain's Uniform was the run away favorite. Maroon movie uniforms are so iconic and very much in demand. My good friend Donna, (who I think hit the lottery last year based on how many great costumes she has won lately), won this. She is building a wonderful collection. 54 Forum members voted in the closest race yet! The Enterprise Sensor Array won out by one vote over the Archer Spaceship Model. Both were awesome pieces, but we have seen the Archer model before, and the Enterprise Sensor Array was a truly great prop! It came apart and had multiple cool panels inside it. I have fallen behind on this, so this week I will be posting one a day. A record 60 members voted and the Picard Stunt Uniform was the winner. I was disappointed in this. First, it wasn't worn by Patrick Stuart, and second there were some very cool other items in Week 73, including the Klingon Pain Stick and the Cardassian Freighter Test Model, which I thought was very cool. None the less, the public has spoken! I have fallen way behind on this, so I have a bunch of these to post. I will be doing one a day this week. This is for Week 71/72, which we listed together because of the overlap. 43 forum members voted and the Pup Probe from the DS9 episode "Forsaken" at $ 2,200 edged out the V'Ger Mind Meld Model. Where is the secondary market? There is always a lively debate about where the secondary market will land after the IAW auctions finish. The market is very soft right now, especially for character costumes, since there are 40-50 of each main character. Screen Used Props is offering up a Tom Paris costume for $ 2,999, close to double what they have gone for on eBay through IAW lately. It hasn't sold since being listed last week. While the listing doesn't say, the costume is displayed with rank pips and a comm badge.